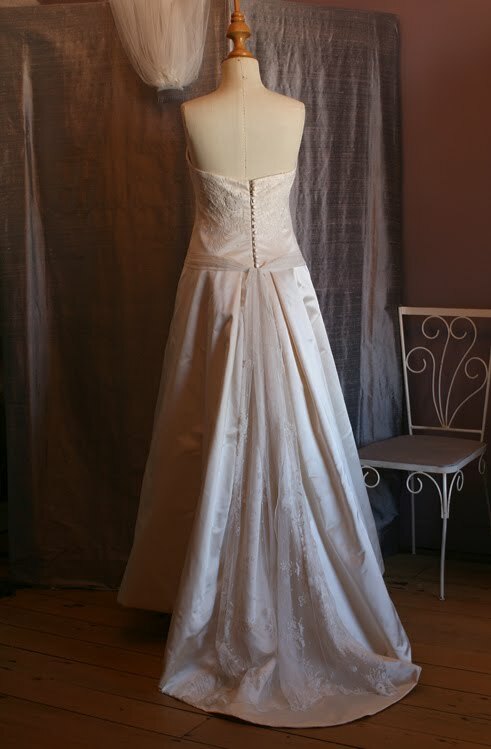 I designed and made wedding dresses for several years, and thought I’d share some favourites! Absolutely beautiful! The lace is gorgeous and just the right amount used I think. Wow, this is just lovely. The lace is so elegant. You opened a new door from me to you. Got a question: with what would you line and underline taffeta? I'm making the “Sabrina” gown for a daughter– sleeveless (not strapless) bodice in the column dress, elbow-sleeve bolero w/ruffled collar, detached train in ivory taffeta. Several have also advised me to buy Susan Khalje's book, (italics) Bridal Couture. Wow – this is absolutely stunning. What a lucky bride! Gorgeous! That's so elegant & timeless. Oooh – beautiful! That lace is just so lovely. When you describe it as “antique” and “delicate” it makes me think “super-high stress” construction. If you don't mind me asking, does the dress have a separate corsolette/foundation to support it? When I make strapless dresses I make a boned foundation with sturdy waist stay and attach the dress at the top edge. I'd love to know how the experts do it! ~Kelley – I am hesitant to give any recommendations without seeing the fabric and design. If the dress is in tafetta and columnar, I would consider fusing the skirt to minimise creasing across the front hip. 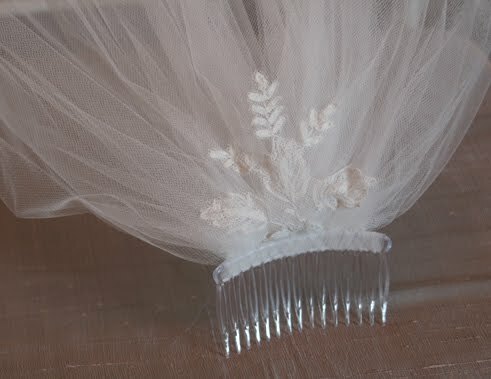 For a full skirt like this one I underline in stiff silk organza. ~Judy – the main worry was making a cutting mistake, as you can't reorder more of this fabric! There were a few little holes we had to work around too. I usually make an internal foundation boned to high hip level and abandon the waist stay – they look so uncomfortable! OMG what a beautiful gown. Can I come over the ditch for some lessons? 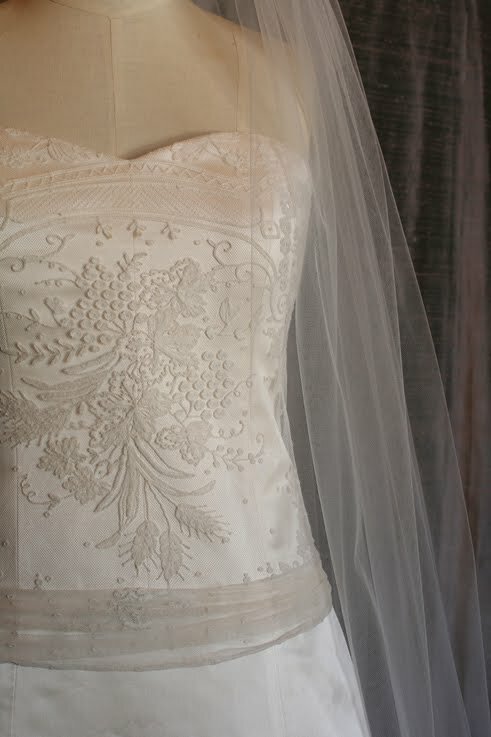 What a great use of that lace – I love the way you get to see a whole piece of it across the bodice. Beautiful work. 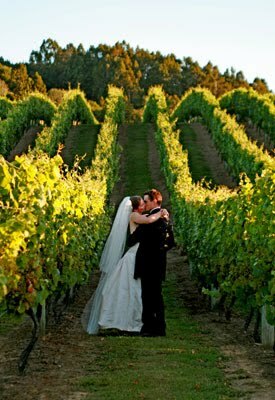 It must be hard working with nervous brides though – bet you've got a good ear as well as nimble fingers. I love it . The use of the lace is really lovely . Did you make the pattern as well ? I am doing a year long course in pattern making at the moment and would love to make wedding dresses one day but I worry that maybe doing it for others and for money might spoil the pleasue I get out of sewing now. What are the pitfalls and is it possible to make money out of ? How many hours would it take to make a dress like this one ? ~mem – when you do it for a job there is time pressure, commitment, and all the other business considerations, so it is not leisurely sewing! Oh my god, that's gorgeous!! It's absolutely beautiful. Love the lace on the bodice. 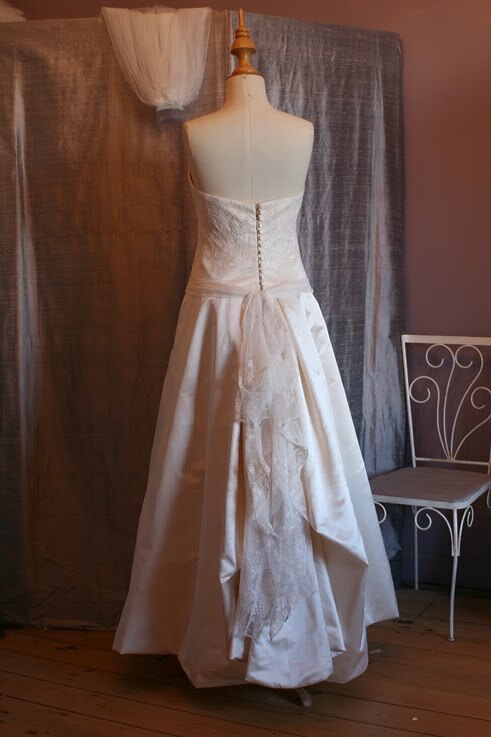 I would love to see more of your wedding gowns!